UPDATE 2100 GMT: Syrian State media is declaring that President Assad has spoken by telephone “with Colonel Mahmoud Sabha, the commander of the group of Syrian Arab Army soldiers who were in Jisr al-Shughour Hospital”. Colonel Sabha made headlines in May 2014 with the release of an audio recording in which he appeared to be ordering troops to use chemical weapons in Idlib and Hama Provinces. 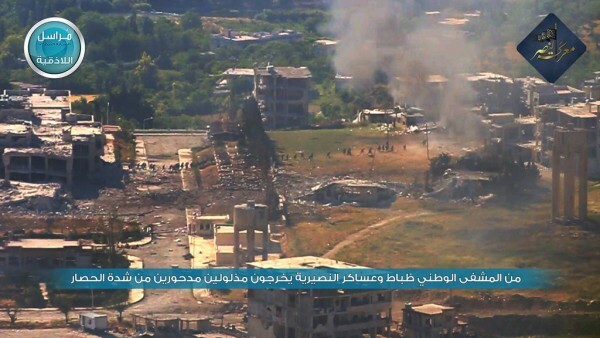 More than 200 trapped regime troops are trying to escape the National Hospital in Jisr al-Shughour, the city in northwest Syria captured by rebels on April 26, and reach safety outside the city. The troops reportedly made the attempt amid shortages of food and water. They also faced the prospect of an underground bomb. as rebels dug a tunnel beneath the building. The soldiers in the National Hospital in Jisr al-Shughour city in Idleb managed to break the siege imposed by Jabhat al-Nusra since late April, in an operation coordinated with airstrikes and artillery firing. The soldiers have been freed and left the hospital, carrying their dead or injured fellow members, and are heading to army posts in Idleb countryside. The fleeing soldiers could then be picked off before they reach regime lines, about 2.5 kms (1.5 miles) from Jisr al-Shughour. The Jaish al-Fateh rebel coalition has declared victory, with the hospital under their control and operations near the Orontes River and olive groves to capture the troops on the run. 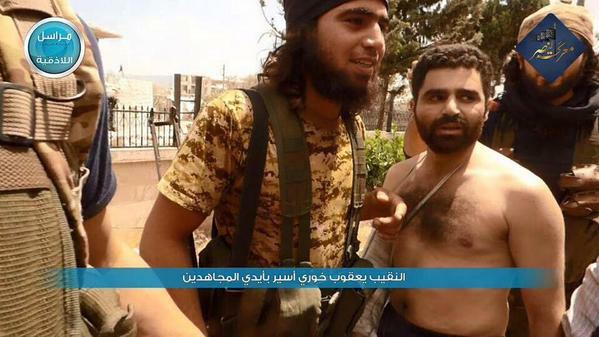 Pro-rebel activists are claiming 65 have been seized and more have been killed and wounded. Named casualties already include Brigadier General Mahmoud Ibrahim al-Baiki, General Rakan ‘Aadl Younis Dawoud, and Colonel Hassan Kamel Rasho. Video on Thursday pointed to increasing regime desperation over the fate of the troops — whom President Assad has pledged to rescue — with helicopters attempting airdrops of water, tinned food, and cigarettes. Some of the airdropped barrels were seized by rebels surrounding the hospital.